Kodály’s Duo for Violin and Cello, Op. 7 is one of a regrettably limited number of pieces crafted for this instrumental combination. Somber and angular, this work, penned at the start of World War I, seems to reflect the dark mood of the time. Kodály, along with compatriot and contemporary Béla Bartók, was an inveterate ethnomusicologist who ferreted out and catalogued multitudinous Hungarian folk songs. This is readily apparent in his Duo, which, with its generous use of pizzicato technique and modal key structure, evokes a decidedly Eastern European flavor. This impassioned, declamatory, melodically acerbic and technically demanding music was handled with sophistication and reverence by the instrumentalists. Violinist Nai-Yuan Hu, the elder statesman of the group, performed with a high degree of stern-faced competence; Bion Tsang spun a warm, full tone on the violin’s larger cousin. Both players clearly communicated the yearning and pathos of the piece, painting a desolate music landscape with a passionate performance. Anton Arensky is the only composer I know to have a glacier named after him, the Arensky Glacier in Antarctica, a rather odd tribute bestowed by the USSR Academy of Sciences in 1987. Musically, Arensky’s output during his brief life was anything but glacial. Case in point: his Trio No. 1 in D minor, Op. 32, a lush, energetic, rhapsodically Romantic work that envelops the listener in a warm blanket of sound. Hu, Tsang, and An combined to weave a flowing, shimmering soundscape with melody lines that rippled through the instruments. The second movement “Scherzo” flowed by in a froth of notes; the nostalgic “Elegia” appropriately paid tribute to cellist Karl Davidov, in whose memory the work was composed. Not surprisingly, the cello figured prominently, and Bion Tsang played with intensity and bravura. All told, hard to imagine a more stirring, glittering performance of this late Romantic gem, a highly appropriate choice for the eve of the eve of Valentine’s Day. 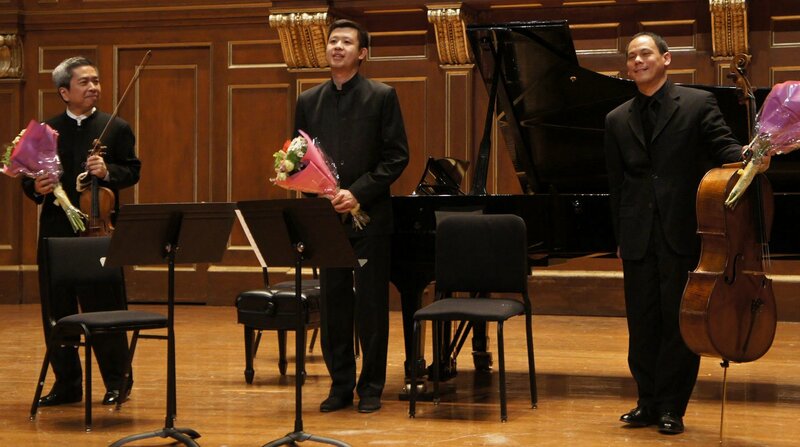 Though only their second collaboration, the musicians played as if the Hu-Tsang-An Trio was a long-established entity. This concert turned out to be much more than the “Intrumental Minds” title suggested. These performers wore their hearts on their sleeves.